We have converted my single place, all metal Moni motor glider into a small, efficient electric airplane. We used our ElectraFlyer propulsion parts kit and our large battery pack, custom built to fit the available space in the airplane. The plane was raised for more ground clearance and a larger, slower-turning, much more efficient prop was installed. Static thrust has increased 60%. The plane received its airworthiness certificate in April 2008 and and has been flying ever since— 125 hour flight time as of February 2013. The flying character of the plane has changed from a very loud, vibrating experience to a smooth quiet ride. 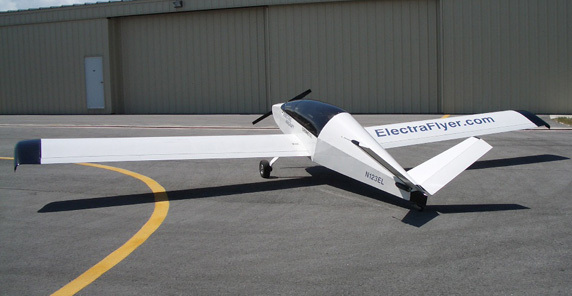 ElectraFlyer-C was the first real electric airplane in the world. It was designed and built as a prototype and proof of concept for economical electric flight. Read more about the ElectraFlyer-C from AVweb.com Contributing Editor, Glenn Pew. Watch the ElectraFlyer-C videos and news clips in the video gallery. Battery Packs: Custom built 5.6kwh lithium-ion polymer for highest capacity per weight (specific energy density) High discharge rate capable of full power takeoff and climb.